When the Minimates started out, they were the same pop culture properties as the rest of Art Aylum's products: Ozzy Osborne, Crouching Tiger, Bruce Lee and Star Trek. Then they branched out and got the Marvel Comics license, and some fancy legal footwork let them do DC characters, as well - if only for a time. Now they've stretched out again, giving us a four-figure set of Minimates based on independent comics: Indymates. Now, granted, AA didn't make Love & Rockets, Strangers in Paradise or Castle Waiting Indymates: all four figures are from Image comics, which is about as mainstream as independents get. On top of that, they're all superheroes (more or less - more on that later), so don't run out to buy this box expecting to find tiny toys of Maggie and Hopey. When New York police detective Sara Pezzini and her partner tried to break up an illegal tournement sponsored by shady businessman Kenneth Irons, they were fatally shot. Before she died, Sara heard the tournament's prize, a mysterious armored gauntlet, calling to her. When she donned the weapon, her injuries were healed and she had become this generation's bearer of the Witchblade. Though Witchblade had a pretty decent tv series a few years ago, the comic has always been less about plot and more about Sara wearing nothing more than the metal tendrils of her semi-sentient costume. The Minimate captures this well - at least from the front. The figure's body is molded from gray plastic, with the "skin" bits painted on, so while she looks appropriately exposed from the front, Witchblade has never been this armored in the back. The Witchblade-y parts are rather organic and random, as they should be, and outlined nicely in black. 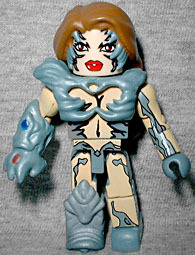 Since Witchblade's costume is more three-dimensional than the average superhero's, the figure has four pieces to add some bulk, including a big boot on her right leg, shoulder/chest padding (surprising no one) and, of course, a removable Witchblade - now any Minimate can be the bearer of this mighty weapon. Her giant hair is also molded with a few bits of costume stuff wrapping down around her face. Between the 3D pieces and the parts painted on, this little block figure has some real depth. Witchblade spun off a character called the Darkness, who spun off a character called Magdalena. Maggy is a nun in the service of the Catholic Church and a direct descendent of Mary Magdalene. In typical comicbook fashion, a character who has willingly chosen a simple life of chastity also chooses to do intense battle in a bikini. This isn't the same Magdalena that Moore Action Collectibles gave us all those years ago: that one apparently died somewhere along the way, to be replaced by a slightly rebellious girl named Patience. Guess that explains the thong and chaps. Magdalena's costume has been created very nicely in the Minimate style - most of the details are simply painted on, but she does have several extra pieces to round things out. On Magdalena's right leg is a boot/kneepad combo, with a small knife sheathed on the side. 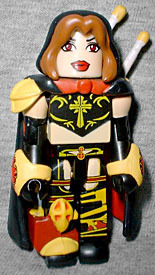 She's wearing yellow bracers with red insignias, and she has a hood pulled up over her head. The hood is intended to look like a part of her black, red-lined cloak, which also has a yellow shoulder pad on the right and two non-removable swords on the back. Repeat: non-removable. 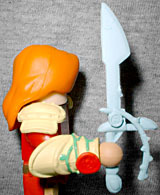 They're a molded part of the cape, though the back of the box shows her holding one of the (bladeless) swords - that just means that someone broke the prototype. Don't try it yourself. Joseph Michael Linsner's Dawn is often cited as the epitome of the stereotypical over-sexualized T&A "bad girl." Never mind that she wears more clothes than Wonder Woman, or that her stories are actually a deep and contextual allegory with some flashes of psychology and philosophy - she's got boobies, so she must be bad. Dawn is the goddess of birth and rebirth and, owing no allegience to any other pantheon or deity, often serves as an intermediary to them all. She was originally just the hostess of an anthology comic, but JML has since fleshed out the character - no pun intended. Dawn's costumes are often a mixture of the extremely feminine and extremely masculine: corsets and lace paired with armor, for instance. The Minimate is wearing a red suit jacket and not much else. She does have big armored shoulderpads and a rose-wrapped gauntlet on her right arm. 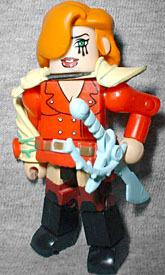 The bottom of her coat is a separate piece, and you can plug the included sword onto her hip. Her hair hangs over her right eye, as it should, and three tears drip from her left. 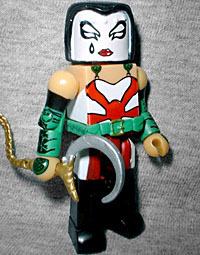 Kabuki is wearing her usual costume: a Rising Sun unitard, knee-high black boots, green arm wraps and, of course, her white kabuki mask, with a single tear below the right eye. She's armed with one of her many weapons, a sickle with a weighted chain attached to the handle. Printed delicately on her back is the giant dragon tattoo that spreads its wings across her shoulders. 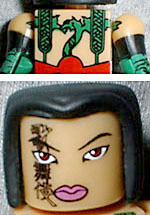 To make Kabuki's mask removable, Art Asylum molded it as part of her hair piece. The whole thing pops off, and can be replaced by a second, maskless block of hair. The scars running down the right side of her face, remnants of a childhood attack, read 歌 (sing), 舞 (dance) and 伎 (skill) - or, read together, "kabuki." All the Minimates share the same body with different paint decos, and they all move at the same 14 points: neck, waist, shoulders, elbows, wrists, hips, knees and ankles. That's a heckuva lot of motion for something so tiny. Starting with Series 8 of the Marvel Minimates, the figures' hair pieces started to come with a peg to hold them in place on the tubular heads, limiting their modularity - if the figure doesn't have a hole in its head, it can't use the hair. All four of the Indymates share this feature, so at least you can swap pieces between them. This initial Indymates box set really lacks diversity: four Image properties, four hot chicks. But there are tons of cool independent comic properties out there that deserve fun little figures like this - let's hope Art Asylum delivers.